The axillary vein arises at the confluence of basilic and brachial veins in the axilla and runs deep to the pectoral muscles to the first rib where it becomes the subclavian vein. During this passage it becomes progressively more superficial and in closer proximity to the axiillary artery. The brachial plexus lies superiorly medially and sub pectorally becomes closely associated with the axilary artery. The medial cord may lie between artery and vein at the level of the coracoid. Long axis US cannulation should have the point of entry into the vein medial to this to avoid nerve injury. 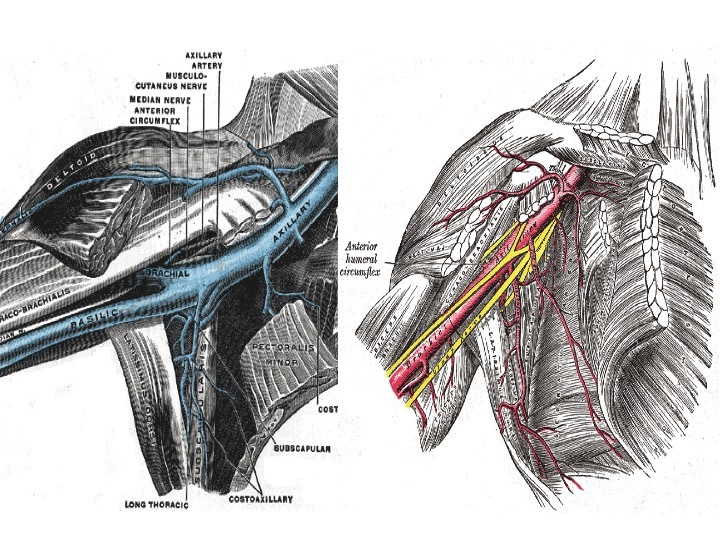 The axillary artery shows arterial pulsation whilst the axillary vein waxes and wanes with breathing. This vessel is normally 3-5cm deep. 3. Prepare sterile field and place US probe in sterile sheath. Use sterile US gel. 5. Identify the delto-pectoral groove below the coracoid process. 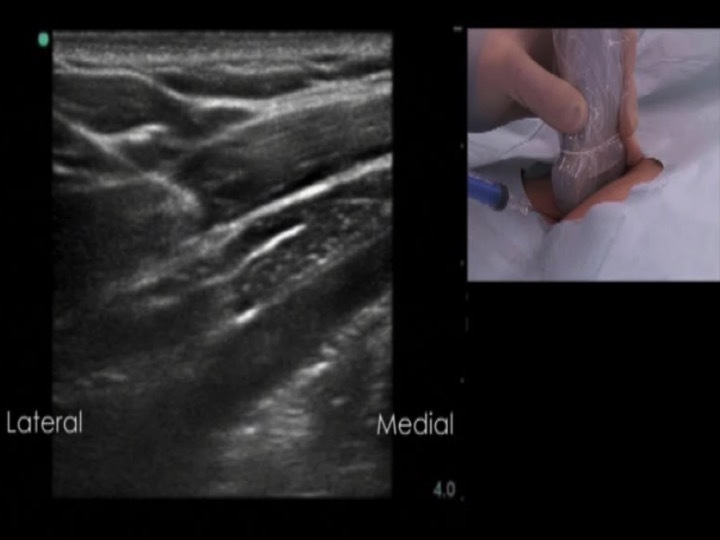 a. SAX Scan across the vessel in SAX and identify axillary artery superiorly and vein inferiorly. The artery is pulsatile and thick walled, the vein is thin walled and varies with breathing. Valsalva and head down position or IV fluid load can improve visualization. b. LAX Place probe in delto-pectoral groove perpendicular to skin. Angulate probe slowly cranially/caudally to find vessels. Confirm artery superior and vein inferiorly. The vein is deeper laterally as it traverses the axilla. Identify Pleura medial and deep. 8. Confirm puncture by aspiration and presence of needle in vein. .Pass Seldinger wire with J tip pointing towards the heart. 9. Complete cannulation as usual. 10. Check line placement by scanning lower neck to confirm catheter is not in IJV and passes into chest. TIP: Asking the patient to turn their head to the side of the cannulation to shut off the IJV orifice decreases the incidence of going up the IJV. Figure 59. 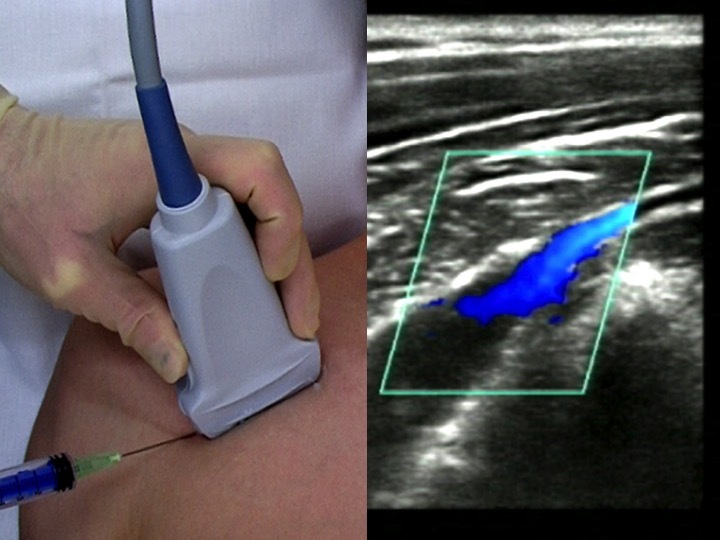 Needle approaching Axillary vein through Pectoral muscles. Pleura not visible.